Last week I shared Part 1 of my interview with Sherry Turkle on the ‘Human Cost of Social Technology.’ Here is Part 2 where we discussed the impact of social media on our own sense of identity. SM: Hi, I’m Simon Mainwaring and I’m here at IVOH in the Catskills, and I’m here with Sherry Turkle, who is the Professor for the Social Studies of Science and Technology at MIT. I was so enjoying our conversation earlier on that I have to have more of you. What I’d love to talk to you about is the reality we all find ourselves in now, which is that we all have multiple versions of ourselves. For example, we have the version of our self we present to our friends and even our families in real life, then we have the version of ourselves we have in our private moments with ourselves, we have the version of our self online like on Facebook or Twitter, and we may have secret accounts where we have another version of our self that we prefer to hide from others. Do you see this sort of simultaneous, multiple versions of ourselves as a common problem? What are the dangers? ST: Well, it’s a common state of being. I think we have to refrain, for the moment, from calling it a problem because it is how we live now. I think it’s become the norm, and each of us are keeping the fact that it is our norm a secret, almost like a dirty little secret, and when we reveal it to someone else, like saying “I really have five accounts or six accounts,” and people reveal they are having trouble keeping them strait. The problem is that we perform ourselves somewhat differently in each of these spaces. There’s good news and bad news. Each time we perform ourselves in each of these spaces, we actually learn something new about ourselves because each of these places is a place where we are performing a different aspect of ourselves, and thus it’s a kind of self-reflective exercise in a way. We get to see different aspects of ourselves in these different spaces. The downside is that, particularly for adolescents who are just forming their sense of self, it becomes hard to keep things strait. They get a kind of performance anxiety in that sense and performance exhaustion because they’re constantly on. They don’t have a place to go that’s offline. They almost don’t have permission in their life to shut it down, to get off those Facebook accounts, to get off those internet accounts. They don’t have a place to go where they’re not performing themselves and that becomes a problem. SM: Let me ask you a question. I can see how that can clearly become a problem. Is it, in a sense, a new definition of what the self is today, in that our sense of self is now an aggregate of all these different versions of ourselves, or are we just fractured or splintered in different ways and we are losing a sense of self altogether? ST: I think we now have a sense of self as multiple. That is becoming the norm, to think of ourselves as a self that is a multiplicity of selves. We are no longer thinking of that as fractured, that’s why I was very careful not to define that as a problem, because actually, there is a truth about the self that the internet is revealing. Rather than seeing it as a problem, I think it’s something we need to learn to embrace and the new goal of living is to move fluidly among these different aspects of self. 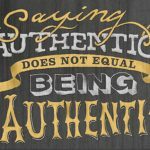 SM: When you say fluidly do you mean authentically and consistently? SM: Is that hard to do when you consider that we’re effectively being led every day by media outlets that train us to perform, in a sense, to present a doctored version of ourselves out there? So the way we’re coming to this is, as media savvy consumers, in a sense, rather than centered beings that want to be consistent and authentic. Let me just say again, the positive is that moving fluidly and authentically among these different aspects of self can be a positive experience of living in the world we now live in. But, as you say, people are learning that on different outlets, they have to be a certain way. I met a young person today who said, “When I’m on Twitter, Twitter has trained me that I have to be ironic and witty, and that’s hard for me because I’m not an ironic and witty person, but I can’t get followers on Twitter unless I’m a certain kind of ironic and witty person. SM: So you’re saying that the media is the messenger? ST: Yes. The way I put it in Alone Together is: Technology is the architect of our intimacies. Technology is the architect, in this case for this young man, of the self. If he wants to be popular on Twitter, he has to be an appealing Twitter personality. Similarly, the people I interview about Facebook, many adolescents will say to me, “I won’t even say on Facebook that my dog died because I want to be, on Facebook, the kind of positive, popular, wonderful person. I doctor the photographs. I doctor my life.” So we’re learning adolescents and young people learn how to be on Facebook, the Facebook way to be, and that starts to be a problem. SM: This addiction to what might be called faux celebrity or personal brand management, what will cause a change? Is it a function of age, or is it a function of our integration and sophistication on how we use these tools? We realize later on a better way to use them. As you get older and more differentiated from your Twitter self, you begin to see that as an other, it’s not really you. So the age thing kicks in, but I also think we are going to get better at dealing with this technology in more mature and sophisticated ways. We are smitten right now. The trouble with this technology… or I shouldn’t say trouble… I should say, the most powerful thing about this technology, and the reason we’re so vulnerable to it is that it’s an identity technology. It’s a technology that offers us identity. It says, “You can be this. You can have these friends. You can have these connections. You can have this love and appreciation, followers, people who want to be with you.” Things that people want. People want this connection. SM: So what would be your advice to anyone, young or old, on Facebook or Twitter, as to how to garner the most integrity between who they are as a person in real life (which is hard enough to know in itself) and how they represent themselves online? Any sort of guide from all your research, thinking and Alone Together? ST: Yes. The first thing is that, if you’re a young person, a healthy sense of distance that being on Facebook is not being you. When I’m interviewing you, you know that if I’m interviewing you about this, you’re going to be telling me that. Make sure you remind yourself of that regularly. Keep a little bit of distance between that Facebook self and your sense of your own self so you can have a sense of distance and irony that things that happen to you on Facebook, slights, hurts, they’re not really happening to you, they’re happening to that you that you perform. I think that is a healthy use of this medium. In every aspect that the people we are online… it’s not who we are. Separating the friends from the friended is a very important thing to do. SM: I’m here speaking with Sherry Turkle, who has written this wonderful book called Alone Together. Where can we find you online? Where can we find the book? ST: AloneTogetherBook.com, and google Sherry Turkle MIT and all of my webpage with all my writings and research will appear. A great couple of interviews. Might challenge the terminology Sherry uses in saying we have multiple ‘selfs’ we move between. In Jungian terms, she is really talking multiple personas. And personas are not a bad thing – they play an important psychological role. But the more of these we put in place, the harder it is for our true self to have a voice…or even for us to know what that true self is. I think Sherry would agree, although she seems to imply that everything is OK if we can move fluidly between these personas. Which I would say is true only if we also have a strong sense of our underpinning self. Otherwise who are we really? And a build from the first interview, and Sherry’s point about substituting connections for conversations. My wife hates social media for this very reason. But interesting my 14 year old son is ambivalent for similar reasons, using Facebook only occasionally for Chat…and never posting on his wall himself. I think because he is either unsure about, or doesn’t want to create a persona that is different to his true self. So it’s not just a generational thing: they both prefer direct, personal and deeper interaction. Interestingly, the only digital media my son has embraced is one-to-one video conferencing on Skype…which is the closest to the real thing on offer I guess.